Why go here? 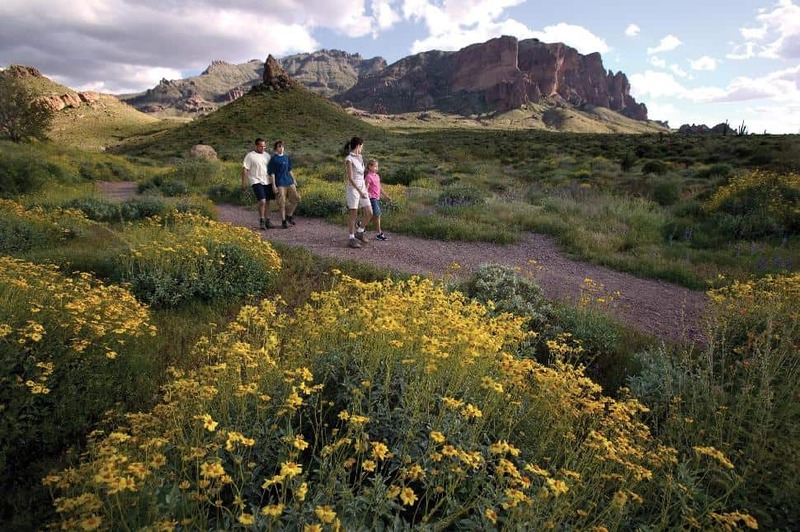 Usery Mountain Regional Park is a 3,648 acre parcel located adjacent to Tonto National Forest. It also sits at the western edge of the Goldfield Mountains. Here, hikers can admire a variety of desert flora and animals. Trails at Usery at well frequented because they provide hikers with enough elevation gain to enjoy incredible valley views. Notes: Stop by the Nature Centre to grab a detailed trail map. Find it at 3939 N. Usery Pass Road (off Ellsworth Road). About Wind Cave Trail: This moderate trail is a popular one, terminating at a cave. A steady seep of water from the cave's roof supports rock daisy blooms. The cave lies along a seam where volcanic tuff meets granite. Due to scorching summer temperatures, the best time to visit Wind Cave is October through April. Parking: Lot available but fills up on weekends/other peak times. Notes: Ascending the trail takes much longer than descent. However, loose pebble means one should take caution when coming back down. Details: A scenic loop with a total elevation gain of 600-700 feet. Doing the loop counter-clockwise offers better views: the back end of the trail weaves through a mountain pass and then places you in front of a wide open desert. It is less crowded than the Wind Cave Trail, and following rain it presents good opportunity for wildflower viewing. Details: Scrambling up Cats Peak Pass affords hikers great views of Usery and the mountains to the north. This is a point to point trail, accessed from Blevins Trail, Meridian Trail or Pass Mountain Trail. See map here. Details: A gentle trail perfect for young hikers, and those who are young at heart. Total elevation of only change of 30 feet. Easily access the trailhead from Buckhorn Camp Drive. Why go here? How can a hiker resist a name like Superstition Wilderness? Several of the trails in Lost Dutchman State Park lead into Superstition Wilderness Area, and into the surrounding Tonto National Forest. This area is the stuff of Old West legends, after all the park is named for a famous gold mine. Details: Don't be fooled by the relatively short distance, this trail weaves up into a canyon (Siphon Draw) and requires some hand climbing. The reward is a very scenic view of the area. It is possible to hike up the Flatiron, however that spur can be considered a wilderness one at times. We advise being an experienced hiker with a good level of fitness. Allow 3 hours for Siphon Draw and five hours to the Flatiron and back. Good hiking boots are imperative. Follow the white and/or blue dots to ensure you remain on the trail. 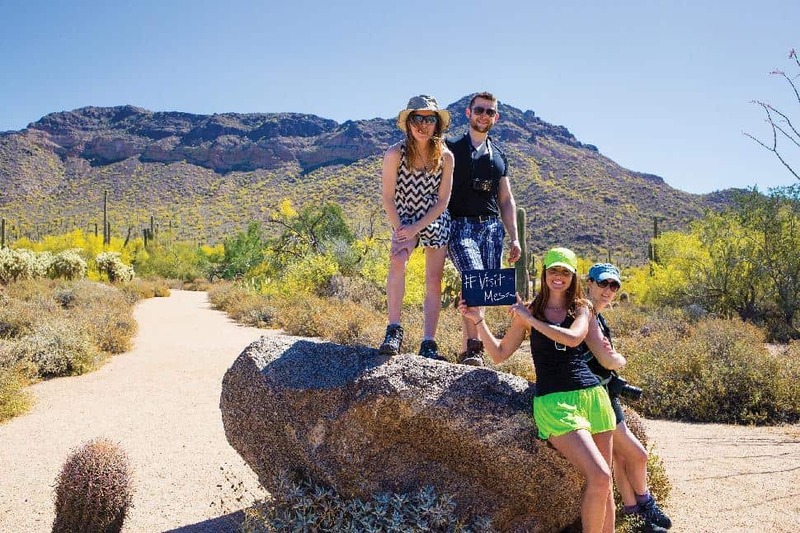 Details: Hike this trail for a close view of the Superstition Mountains and Apache Junction, all set against the desert expanse. Enjoy rock formations at mile 1 or admire the view from one of five benches found along the trail. Following rainfall, Treasure Loop Trail is a great place to see colorful spring blooms. This is rated moderate due to an elevation gain of 500 feet. Extend your hike by a half mile by exploring the spur trail that winds up to the Praying Hands rock formation. Note that this short spur is more strenuous than the gentle grade of Treasure Loop Trail. Why go here? Explore San Tan for its escarpment terrain (southern portion of the park) and its Lower Sonoran Desert landscape. The park measures 10,000 acres, is anchored by Goldmine Mountain it the northern area. 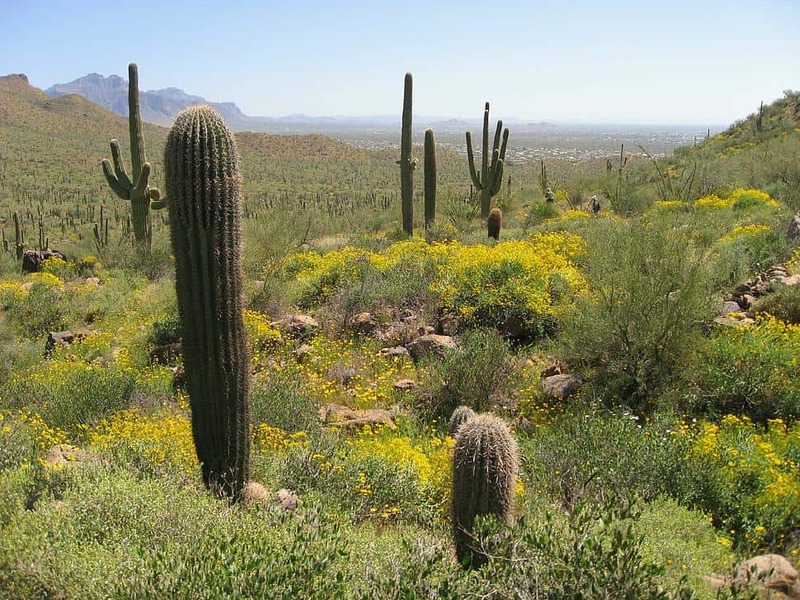 The flora ranges from creosote flats to thick saguaro forest. Notes: All trails are multi-use unless otherwise designated and users are encouraged to practice good trail etiquette. Details: The Outer Loop presents the longest challenge to hikers in San Tan. The trail is made up of the San Tan, Malpais, Dynamite, Goldmine and Littleleaf. As such, this hike traverses dynamic terrain. Weave through mountains, and over washes and rolling lowland. The Petroglyph of San Tan and Saguaro are trip highlights. Details: This route brings hikers through Broken Lands and Central Valley portions of San Tan. It also puts users on top of the Goldmine Mountains. (Enjoy the view!) This trail is rated moderate for length, but also because some caution should be used on washes, soft soil and slick or rocky steep mountain slopes. Details: This trail makes for a casual walk, perfect for an all age adventure. 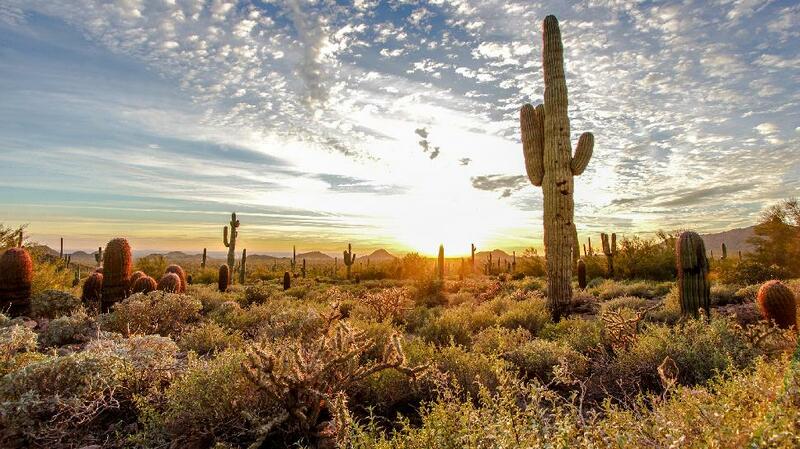 Take in the Sonoran Desert landscape or catch a sunset. The route encounters a few small hills at the end of Littleleaf but the rest is pretty well flat; gradual elevation gain of just 50 feet. Why go here? Tonto is a big deal; it boasts the fifth largest forest in the United States. (3 million acres!) It'd rate even higher if you were only counting contiguous USA. Its close proximity to Mesa and other cities make it one of the most visited 'urban' forests in the country. Tonto National Forest is an outdoor recreation Valhalla. It contains eight wilderness areas, represents Lower Sonoran sub-desert, and contains lakes, reservoirs and pine forests. Notes: Mesa Ranger Station located at 5140 E. Ingram Street, Mesa. Find picnic areas here; equipped with varying amenities. 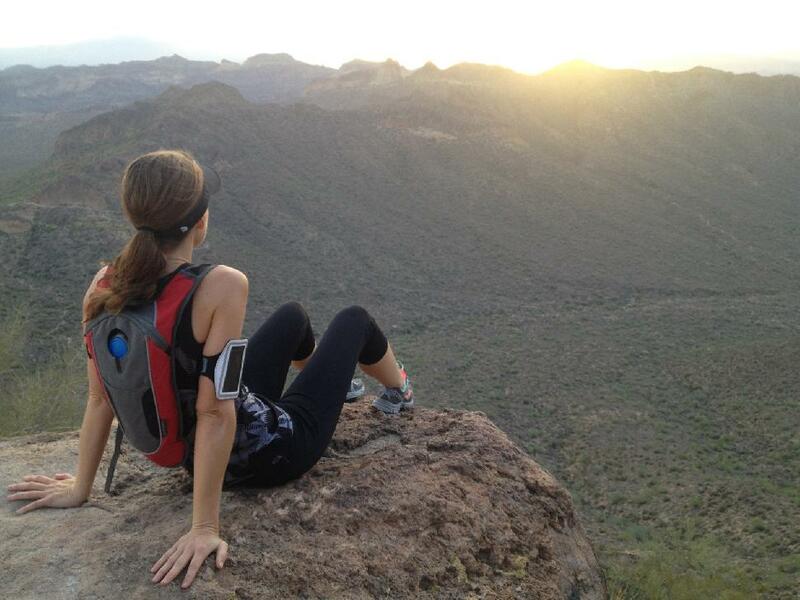 Details: Enjoy a climb up the western slope of the Superstition Mountains. Turn around and admire the valley views below. Look up and see rock formations above. As you ascend, keep your eye out for Saguaro Cacti and PaloVerde. Details: An easy hike up to an area where Indian petroglyphics are. Trail begins at the forest boundary. Details: This loop trail passes through Sonoran Desert vegetation and into pockets of semi-desert grasslands. Pine Creek runs seasonally through landscapes of mesquite and cottonwoods. There are some interesting sandstone rock formations to be found at the trail's edge. Spring brings an host of colourful wildflowers - you'll certainly want to bring the camera. Details: Fans of Alter Creek trail love the diversity of landscapes it weaves through. Transition completely from arid desert to pine forest. The trail earns a difficult rating due to its length, but also because it can be washed out or overgrown in places. The hike will bring you along the southern slopes of Four Peaks before following Alder Creek and climbing to Black Bear Saddle. Details: Head off to Ballantine Canyon and take in the diversity of the Sonoran Desert. Explore sandstone rock formations and desert riparian areas. Ballantine Trail is long and slightly difficult to navigate once hikers have exited the canyon. Bring a map. Just an hour outside of the Phoenix Arizona lies one of the best hiking areas.